I’m often asked, “If we choose all that we do, then why do people choose to be alcoholics?” I am asked this question often by those wishing to challenge the concept that we choose our behaviors. Is alcoholism a choice? Before I respond to that question, we need to look at why people drink alcohol in the first place. Over the last 25 years, eighty per cent of my clients have been substance abusers or compulsive drinkers/users. I’ve had a passing fancy with it myself. You can say it is my specialty as I have worked with thousands of alcohol and drug abusers and addicts over the years. 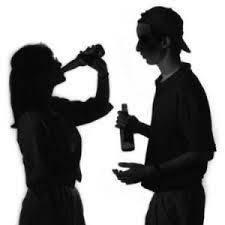 The average person has their first drink of alcohol around the age of 15. The first time you had an alcoholic drink, you might recall that it did not taste good at all. What it did do, however, was create a feeling of euphoria. It could be said that your first drink was a sensation more than it was a taste. From the sensation came the desire to experience the sensation again, regardless of the taste. In simple terms, you liked the way it made you feel. If it didn’t do that, you couldn’t give it away. The more the sensation was desired, the more one is able to acquire a taste for it. In other words . . . become accustomed to the taste for the sake of the sensation. You liked how you felt indifferent about what others might think of you or what image you feel you have to project to others. Your inhibitions lowered so much that you began to feel relaxed, worry-free, and perhaps some feelings of elation. Current emotions would become exaggerated. You felt pleasure which you confused for happiness. You were in the midst of others who were experiencing the same things along with you. Everyone saw each other as pleasing, fun, and acceptable. You probably laughed more and talked more. If an introvert, you became an extrovert. If worried, you felt apathetic toward whatever was bothering you. If weak you became fearless. You came out and said things that you would normally keep bottled up inside and now was easing all of your tension and stress. You had found a magic elixir that released you from all of those things that were consuming your unpleasant thoughts and unhappiness. Not everyone who consumes alcohol has this awareness, acquires a taste, or has a fondness for the potion. There are those who feel they don’t like to lose control of their thoughts and behaviors. If they drink at all, it would be sparingly and in social situations only. They may even opt for some other beverage rather than alcohol. The same applies for those who use drugs. There are also those who may have a glass of wine occasionally when dining out. They generally won’t have more than one or 2 glasses of wine and then stop. There are also those who may wish to have a drink when they come home from work . . . to “relax” or “unwind.” Again . . . they are drinking for the effect more than for the taste. So why do people drink? For the effect. They like how it makes them feel. 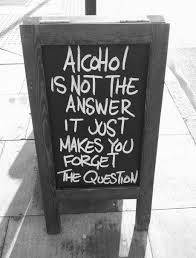 Is there anyone who has not heard or is not aware of the fact that alcohol is an addictive substance? If you are aware that what you are consuming is addictive and yet you continue to consume it anyway . . . is that not a choice? In Choice Theory, we know that the four components of Total Behavior is Thinking, Feeling, Physiology, and Acting. Of those four components, we have direct control of only two of them: Thinking and Acting. But there is always an exception to the rule. There are two things that DO have a direct effect on one’s emotions and physiology: Alcohol and drugs, including prescription drugs. There are very few prescription drugs that cure any of the major illnesses from which people suffer. A great many of our prescription drugs, at best, only mask symptoms by drugging the brain or keep the condition in check without a cure. Illegal drugs and alcohol can do much of the same thing and one doesn’t generally have to wait very long for them to take effect. I don’t know of anyone who has said, “I think I’ll become addicted to alcohol (or meth, cocaine, heroin, cannabis, etc). All addicts/alcoholics have several things in common. One of those commonalities is how they became addicts/alcoholics in the first place. They discovered that they got pleasure from drinking and using as well as it being a cure, albeit temporary, for those things that are pressing on their mind. They are actually anesthetizing their brain and numbing all of their unwanted emotions. To seek the pleasant to satisfy the unpleasant is a natural human behavior. We go from minute to minute, from day to day choosing behaviors that are purposefully designed to create happiness or pleasure. If cold, we turn up the thermostat or add clothing. If too hot, we turn the thermostat down or dress more lightly. If we have an upset stomach, there are antacids to ease the discomfort. If we get caught in the rain, we seek shelter. If hungry we eat. If thirsty, we drink. The actions we take to satisfy these unpleasant situations are all choices. Alcohol and drugs provide relief for other displeasures such as conflict with spouses, relationships, jobs, kids, debt, grief, anger, disappointments, tension, anxiety, and sadness. While being fully aware that drugs and alcohol are addictive substances, the false belief that one is in control of his/her use is why they become addicted. They believe they will be able to recongnize if and when their use becomes a problem. 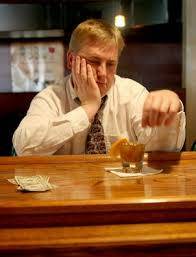 The addiction will always be recongized by others long before the alcoholic or addict ever sees it. Once the cellular structure of one’s brain, organs, and muscles, have been altered due to regular and continued use, the body can no longer function without the substance without going through physical and emotional discomfort. This condition is more commonly recognized as withdrawal symptoms. Withdrawal symptoms can be very severe and are always unpleasant. They can even lead to death. After any period of deprivation, when the cells do not receive their alcohol/drugs, they sort of revolt and readjust causing some physical complications and emotional distress. So if we can control our temperature discomfort, our hunger/thirst discomfort, and our need for shelter, we can also control our withdrawal symptoms by giving the cells that which they are accustomed that will end the suffering . . . drugs and alcohol. Ironically, the substance that is the cause of the suffering is what is being relied upon to end the suffering. The most insidious aspect of addition is that the addict/alcoholic is totally unaware that they are addicted even when everyone else around them can see it. This phenomina is known in the psychiatric world as “anosognosia.” Both the physical body and the socio-psychological part of the brain have become dependent on the substance. When an unhappy person is faced with the reality that they don’t have the things they want in life that provide them with happiness; adding the idea that they are out of control and addicted will only add fuel to their unhappiness. When all their present known abilities to satisfy their unhappiness has failed, they have learned that drugs and alcohol will always make them feel better, if only on a temporary basis. Therefore, they have to continue to drink or use in order to feel better. By not drinking or using, they would feel much worse and unhappy. They know no other way to ease their frustration. It would be too painful, emotionally and physically, for them to stop drinking or using. So is their addiction a choice? Yes. However it is an indirect choice. One first becomes reliant on drinking/using to satisfy social needs and interacting with others is a spirit of happiness. . . a social addiction. About the same time, one learns that drugs/alcohol is a quick fix to overcome unwanted emotions from unwanted situations. This is a psychological addiciton. The percepiton of their use at this time is not one of addiction. It is one of relief. The next stage is when one crosses over the line into cellular adaptation as a result of regular or consistent use of the substance. The cellular structure of the body eventually adjusts to the regular presence of the substance. The addict/alcoholic gets blindsided and doesn’t see it coming. They are now physically addicted and still refuse to believe it. The overall dependency is now so strong that they refuse to believe they are out of control. They believe that they actually need it in order to survive and feel “normal.” And when they eventually do realize they are addicted, they are still defiant against sobriety because they don’t possess the means to deal with their unhappiness without it. They have tried everything else that they know in order to find happiness so they are not aware of anything else they can do besides rely on their drug of choice. They know they can rely on their drugs or alcohol and it has practically instant results. Nothing else will work as quickly. If given a choice between instant gratification versus 5 days of detoxification and 90 or more days of rehab and months or years of learning new ways to deal with life on life’s terms . . . which one do you think they will choose? If someone has to put something into their body in order to feel happy, they are only temporarily masking their unhappiness and their life is out of control. They have not learned how to find happiness by breathing pure air. There is no happiness pill. There are only brain and emotional numbing drugs to mask unhappiness.